Home » New York » New York » Manhattan Shaolin Kungfu & Qigong, Inc.
Manhattan Shaolin offers kungfu and qigong classes for children, teens and adults. 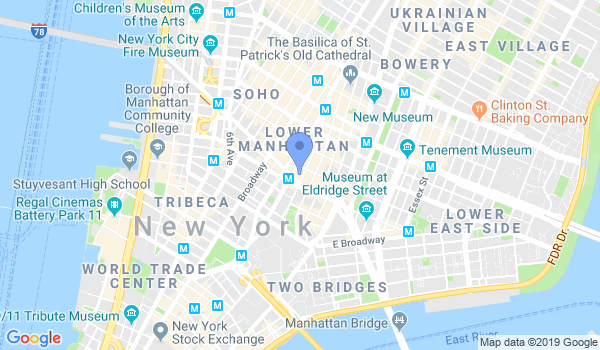 We are conveniently located in Chinatown near the Canal Street station. Traditional Shaolin martial arts are a fun and effective way to develop mental focus, flexibility and physical coordination. Qigong practice combines deep breathing with drills and specific postures to regulate your body's energy. This can lead to balanced emotions, improved immune system function and a clearer mind. Childrens classes are for ages 6 and up. Would you like more information on hours, classes and programs available at Manhattan Shaolin Kungfu & Qigong, Inc.? Please contact the school with your questions. Update the details, Write a Review or Report Error of Manhattan Shaolin Kungfu & Qigong, Inc..
View all Dojo in New York or in Zip code 10013.